SPRINGFIELD, OHIO: Dole Food Co Inc said on Friday the US Department of Justice was investigating a deadly Listeria monocytogenes outbreak linked to packaged salad products from its processing plant in Springfield, Ohio. Listeria, a common bacterium that can be either harmless or pathogenic, can enter a processing facility via raw produce or other materials, and form colonies. Thirty-three people in the United States and Canada fell ill in the outbreak from May 2015 to February 2016. All were hospitalized and four died. One of those who succumbed to the infection lived in Michigan. It’s not clear where the others lived. In total, there were 14 cases of Listeria monocytogenes in five provinces related to the outbreak: Ontario had nine cases, Quebec two, New Brunswick one, Prince Edward Island one, and a Newfoundland and Labrador one. Plant officials found evidence of Listeria contamination there as early as July 2014, Food Safety News (FSN) reported on Friday. A Food and Drug Administration (FDA) inspection report obtained by FSN and reviewed by Reuters on Friday showed that Dole’s tests of surfaces at the plant came back positive for Listeria on nine separate occasions in 2014 and 2015. Dole said in its statement that the report dealt with issues that had already been corrected. The report, dated Feb. 5, said the plant’s third-party laboratory had notified Dole about positive Listeria test results from internal samples taken on Jan. 5 and 7. But it did not say whether testing was done to determine whether the bacteria posed a threat. “If you have ongoing, persistent contamination, that can indicate that you have a sanitation problem,” Craig Hedberg, a professor of environmental health sciences at the University of Minnesota’s School of Public Health, said in a phone interview on Friday. The FDA inspected the plant five times in January and February 2016. Product samples collected at various stages of salad processing on Jan. 16 tested positive for Listeria monocytogenes, a strain that can cause severe illness, the report said. 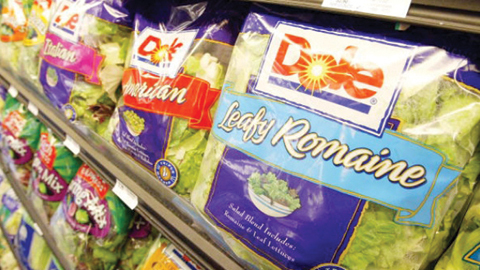 On Jan. 26, Dole told inspectors the company was aware that the Canadian Food Inspection Agency (CFIA) had found Listeria monocytogenes in four salad product samples collected by the agency earlier that month, according to the report. The samples found by FDA and CFIA were genetic matches to those taken from multiple individuals who fell ill during the outbreak. According to the FDA, Listeria monocytogenes can cause serious and sometimes fatal infections in young children, frail or elderly people, and others with weakened immune systems.